Bacon pieces and maple syrup give this cornbread amazing flavor, and the maple and butter glaze is the perfect finishing touch. This is one of my favorite cornbread hacks! This would make an excellent cornbread to serve with breakfast or brunch, or bake it to go with beans, chili, or greens. 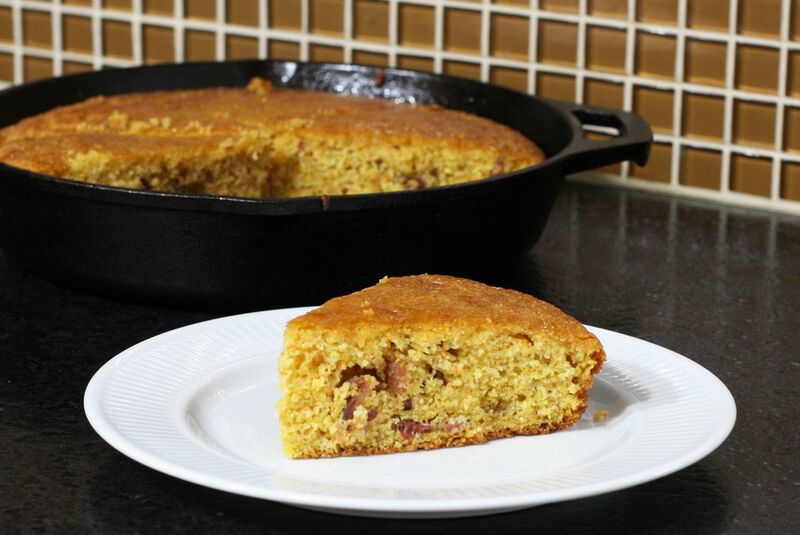 If you don't have a cast iron skillet, you can bake the cornbread in a 9-inch square pan or round cake pan. For a browned crispy crust, heat the pan before you add the batter. Put 2 teaspoons of vegetable oil and 1 teaspoon of bacon drippings in a heavy 10-inch cast iron skillet. Heat the oven to 425° F. Place the skillet in the oven. In a mixing bowl combine the crumbled bacon, cornmeal, flour, salt, baking powder, and soda. In another bowl, whisk the remaining 1/4 cup of oil with the buttermilk, 1/4 cup of maple syrup, and 2 large eggs. With potholders or oven mitt, carefully remove the hot pan from the oven and place it on a metal rack. Combine the dry ingredients and wet ingredients, stirring just until blended. Pour the batter into the hot skillet and return to the oven. Meanwhile, heat (microwave or stovetop) the 2 tablespoons of maple syrup with the butter until the butter is melted and the mixture is hot and bubbly. Bake the cornbread for 15 minutes, remove to the rack, and quickly brush with the maple and butter mixture. Return the cornbread to the oven for 5 to 7 minutes longer. Let the cornbread cool, and then cut into wedges.